I’ve been running for exercise and fun since my pre-teen years. Never took it seriously. Was never pushed or encouraged to pursue it as a sport. I just loved running. And it was the one thing I could do to outcompete all the kids in the neighborhood, primarily because I had good stamina. More often than not, I’d just go for runs. Putting one foot over the other. Never thinking about proper form, technique or following a running training program. More than 25 years later, I’m still doing that. I’m still a running beginner. My recent participation in running events prompted me to reevaluate my running. The top ten finishers in these events are animals. They run twice as fast as me, have double the energy and stamina. They take running seriously, with proper form, technique, training program, and nutrition. And here I thought if I just run, and run for fun, I’ll improve. My running has been the same for decades. So, I decided to take running seriously. Just take a look at the screenshot below, you’ll see why. 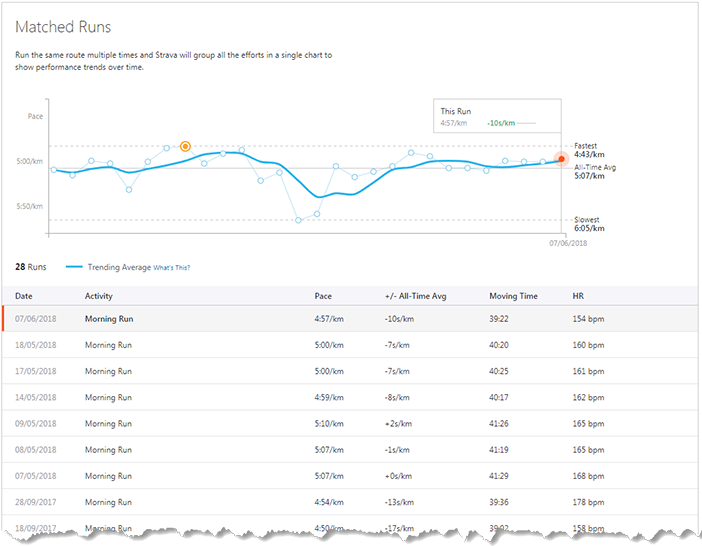 I ran the same route a dozen of times, barely cracking the 5min/km pace, not improving at all.